Includes Men’s Amateur Grand Prix & Pro Qualifier. See the complete 13th Australian Pro Grand Prix from every round of the PREJUDGING through to the posing routines, exciting posedown and awards at the FINALS. See the complete 13th Australian Pro Grand Prix from every round of the PREJUDGING through to the posing routines, exciting posedown and awards at the FINALS. 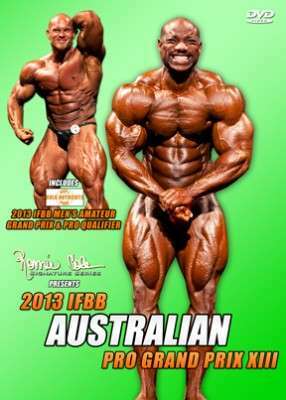 This was a record breaking 4th victory for the very popular DEXTER JACKSON at the Australian Pro Grand Prix. Dexter is also the current Arnold Classic champion. This DVD also includes the 2013 NPFC-IFBB Australian Men’s Amateur Grand Prix and Pro Qualifier, with the Qualifier being won by LUKE SCHEMBRI. In the AMATEUR MEN’S GP, you see all of the comparisons, posing and awards. Nothing from the contest has been left out. The event was superbly promoted by Tony Doherty as part of the FitX – Sport & Fitness Expo 2013. The professional class was sponsored by Ronnie Coleman Signature Series and the Amateur Grand Prix and Pro Qualifier was sponsored by Bulk Nutrients.